Jordi really likes it when a nice specimen also has a rare mineral on it. Well some of this 'infirmity' has rubbed off on me so I am also affected by the same thrill. 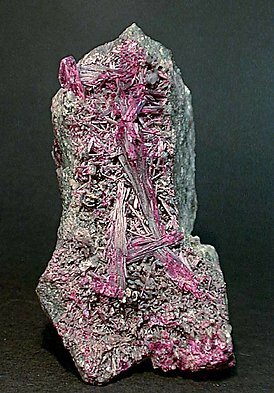 So, in this one I can see the beauty of the large crystals of Erythrite which are long but covered with a rare mineral: Barium-pharmacosiderite. As we have done an analysis of this we can send you a copy. In fact we are also letting you know about something most people are unaware of - the presence of this mineral from Bou-Azzer. Which is something else we like to do!